Yay! It’s fall and soon the leaves will be changing and turning brilliant shades of yellows, reds, and oranges! 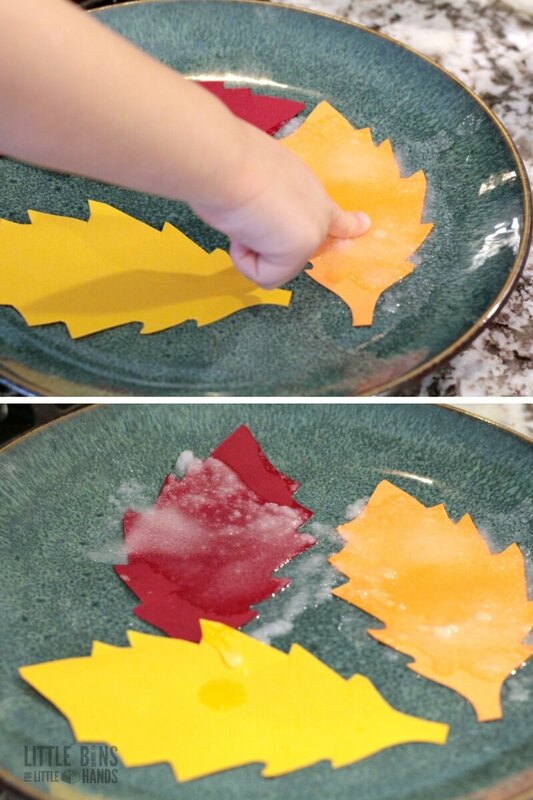 I can’t wait but until them, we can totally try out leaf themed science activities like this salt crystal leaves science experiment perfect for young kids. Growing salt crystals is a really fun and simple kitchen science style experiment you can do either at home or in the classroom. Simple science and STEM is our favorite no matter what the season. Themed science ideas are great for young kids because it really gets them excited to explore and learn. Plus it also gives you an opportunity to repeat similar science experiments to solidify understanding! We also have gingerbread man salt crystal science, snowflake salt crystal science, hearts salt crystal science, and Easter salt crystal science. See how easy it is! I also like to think of these science projects as science crafts because you get to play with shapes and colors too! Growing borax crystals is an alternative to growing salt crystals. A great experiment would be to try both and compare results and solutions. 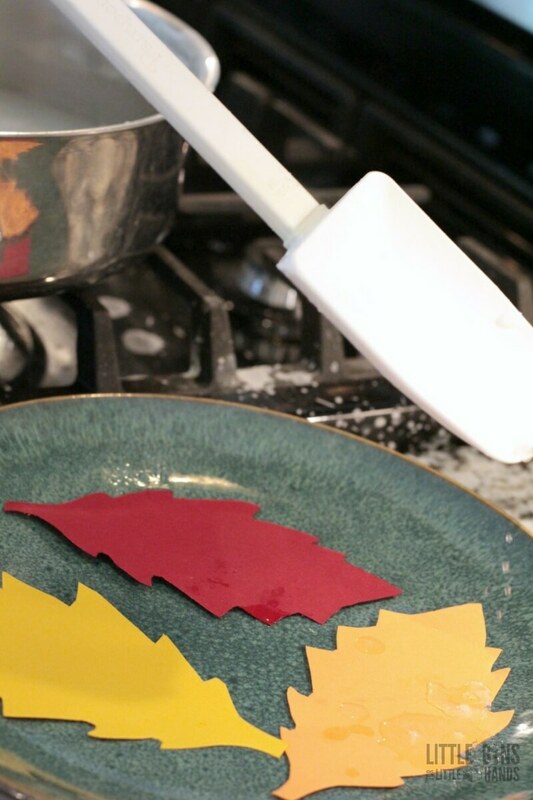 What’s the science behind this simple kitchen activity? A super saturated solution! A super saturated solution is a mixture that can’t hold any more particles. Like with the salt here, we have filled all the space in the water with salt and the rest is left behind. Water molecules are close together in cold water, but when you heat the water up, the molecules spread away from each other. 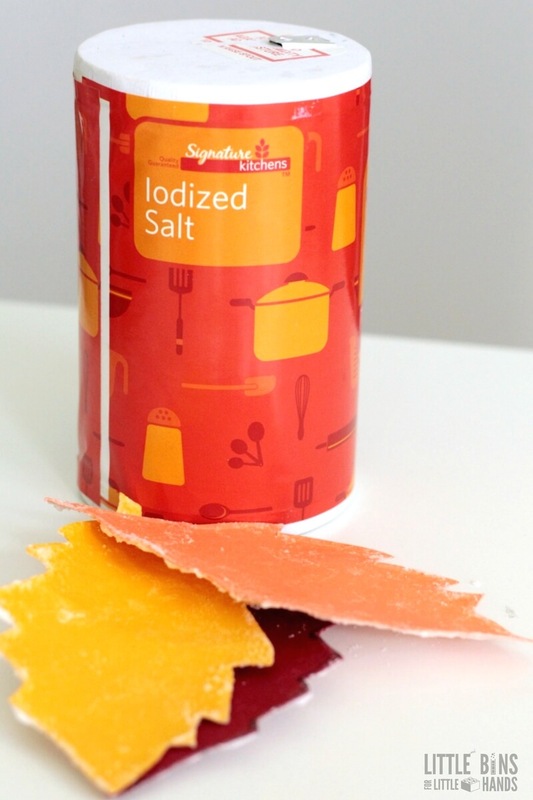 This is what allows you to add more salt to get that super saturated solution. It even appears cloudy. MAKE IT AN EXPERIMENT: Try this experiment with cold water to compare the differences in the amount of salt needed to get this mixture, and you can compare the results of the crystals afterwards. BEFORE you pour the solution, move your tray to a quite location that won’t be disturbed. It’s easier then trying to do it after you have added the liquid. We know! Go ahead and pour your mixture over the leaves just covering them with a thin layer of the solution. HOW DO THE SALT CRYSTALS FORM? You have already learned a bit about a super saturated solution and how it’s made and you have also learned that a crystal is made up of molecules that will form a specific pattern if properly grown. So how do the salt crystals grow? As the solution cools the water molecules start to come back together, the particles of salt in the solution fall out of place and onto the paper. More will connect with the molecules that have already fallen out of the solution. We have 35+ Awesome Science Activities for the young scientist to check out! STEP1: Cut out leaf shapes from paper. You can even use a cookie cutter or free hand your designs! Maybe trace leaves you find outside for an added art project and nature walk. You could also try this creative leaf art project if you go with tracing real leaves. NOTE: You can turn these into ornaments by punching holes into the tips before you crystalize them. STEP 3: Put leaves on plate with space between each one. I find it’s best to move your plate or tray to a quiet location before you pour your mixture on top. This way you don’t spill everything everywhere and that you don’t keep bumping into it as the crystals are forming. STEP 4: Pour the salt water solution over the leaves and wait! STEP 5: Let your salt crystal leaves sit until the water evaporates. MAKE SURE TO EXAMIN the leaves along the way and check out the crystal growth! STEP6: Let dry completely on paper towels if necessary and enjoy! Make sure to leave out a magnifying glass for your kids to explore close up what the crystals look like! A fun fall science craft, fall STEM project, or fall themed activity to add to any lesson plan or learning time at home! 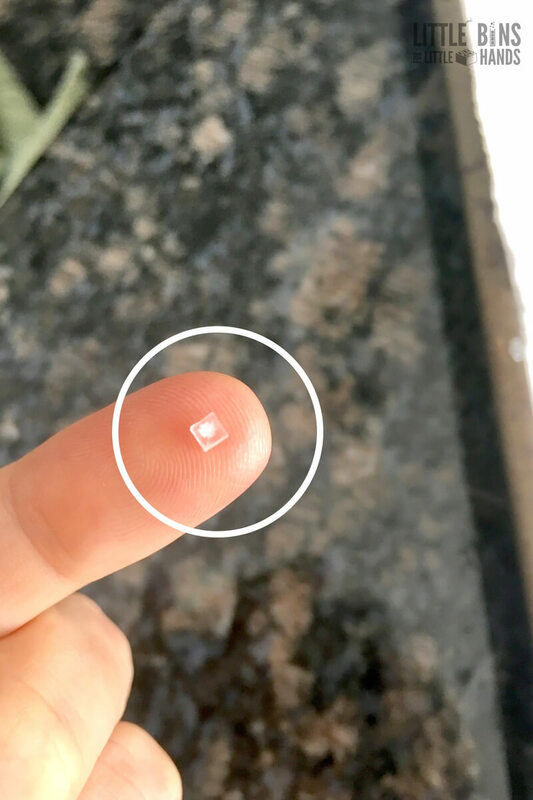 Salt is a basic kitchen supply and this salt crystal leaves science experiment is perfect. Did you know you could enjoy neat but simple science using it? 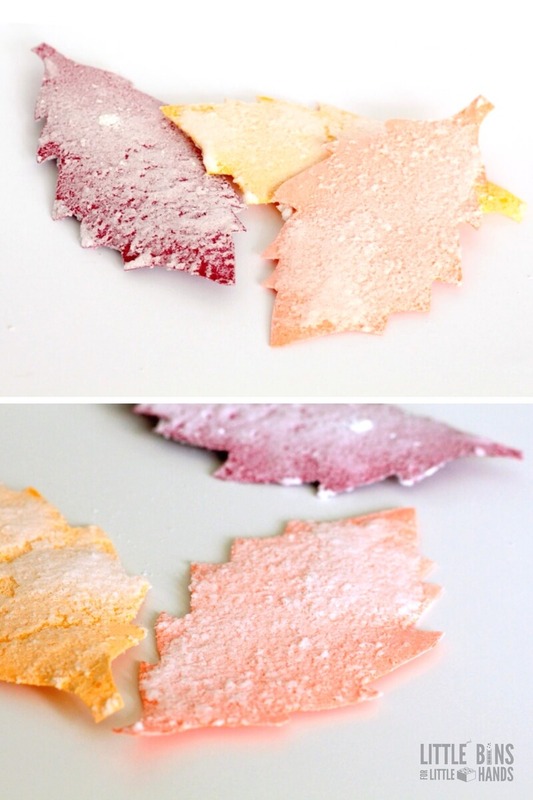 TRY FALL THEMED SCIENCE WITH SALT CRYSTAL LEAVES! Follow along with us to see what we are doing around here each week! I promise I won’t send tons of emails. Subscribe below by clicking on the black box. Definitely going to try the Apple and pumpkin Science activities. Awesome! Share over on our FB page how it goes.